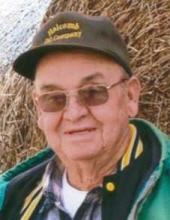 Donald H. Smith, age 89, of Rural Kirkwood, Illinois, passed away at 3:45 PM on March 28, 2019 at his residence. He was born on May 9, 1929 in Rural Kirkwood, Illinois, the son of Robert Miles Smith, Sr. and Ruth Elizabeth Pape-Smith. Don attended elementary school in Kirkwood and Biggsville High School. He was previously married to Beatrice L. Simmons and later was married to Sylvia Ebert and both are surviving. Don farmed the family farm near Kirkwood throughout his entire career and was a life-time farmer. He also did custom corn shelling for a number of years with Dean. Donald also operated a Livestock Trucking Business for many years locally. Donald loved family picnics and gatherings and devoted his entire life to working with cattle and hogs and calving. Don was a 65 year member of A. Lincoln #518 Masonic Lodge. Donald is survived by two daughters, Donna (George) Carson of Colchester, Illinois and Diana (Roger) Keever of Kirkwood, Illinois, three sons, Bill Smith of Gladstone, Illinois, Bruce (Anita) Smith of Biggsville, Illinois, and Brian (Chrissy) Smith of Rural Kirkwood, Illinois, six grandchildren; Dana (Ron) Ross, Deana (Mark) Twenhafel, Kari (Will) Hall, Shana (Brett) Kennon, Alicia (Gavin) Mitchell, Brandy (R.K.) Howell, thirteen great-grandchildren, and one brother, Jim Smith of Dubuque, Iowa. A number of other relatives also survive. He is preceded in death by his parents and three brothers; Bob, Merwin, and Dale. A funeral service is planned for 2:00 PM on Thursday, April 4, 2019 at the Biggsville United Methodist Church in Biggsville, Illinois. Visitation will be held from 5:15-7:00 PM on Wednesday, April 3, 2019 at Turnbull Funeral Home in Monmouth, Illinois. Masonic Rites are planned for 5:00 PM prior to the visitation at the Funeral Home. Interment will be in the Biggsville Township Cemetery. Memorials are being established for the Biggsville Ambulance Service or the Biggsville United Methodist Church. To send flowers or a remembrance gift to the family of Donald H. Smith, please visit our Tribute Store. "Email Address" would like to share the life celebration of Donald H. Smith. Click on the "link" to go to share a favorite memory or leave a condolence message for the family.